"You captured the feel of the other pieces with your work so that your design looked like it had been in the room since the beginning." 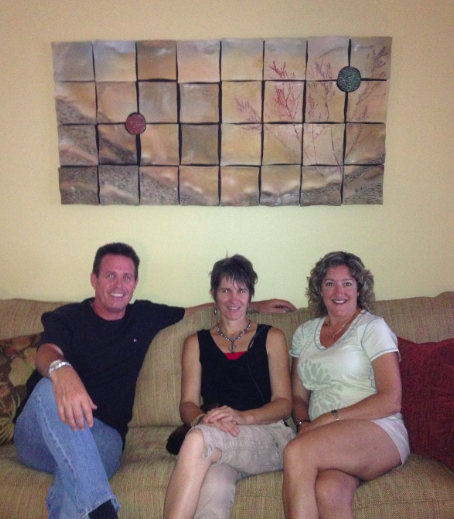 Both Becky and I were thrilled with the fireplace creation that you designed and installed in our home. We were very impressed by how much time you took, and the dialogue you had with us, to determine the look and feel that the piece needed. 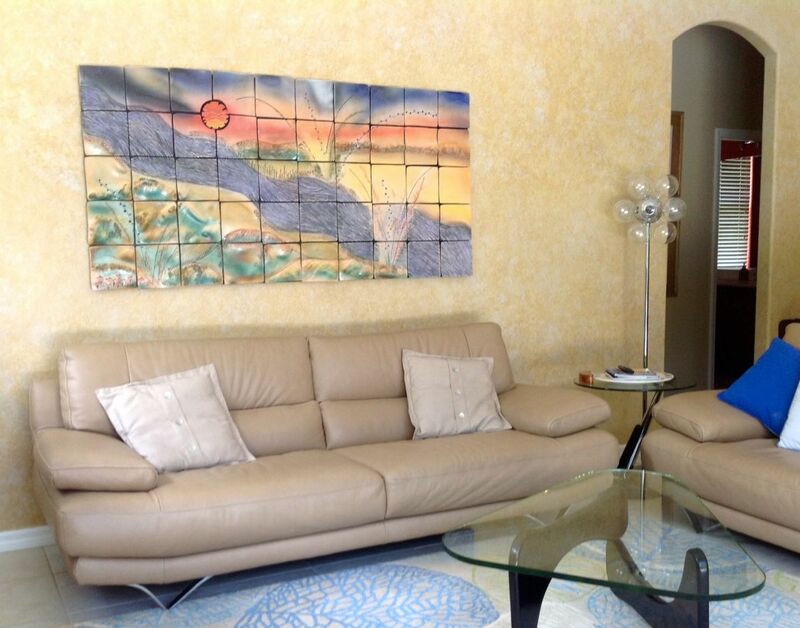 The color palette you selected for the piece complemented the surrounding artwork in our home perfectly. You captured the feel of the other pieces with your work so that your design looked like it had been in the room since the beginning. We were always up to date on where you were in your process. Watching the videos of the piece as it was first designed and seeing the clay tiles being carved was fascinating. Your installation process was seamless and we were so excited when you took the protective tape off of the work for the big reveal. You are a very talented artist, but you excel in communicating with your clients. The whole experience was great. We look forward to working with you again on our fountain project. "The piece turned out even better than we envisioned. The art fits the space perfectly. It captures the surrounding colors from our home and landscape. In short, it is a beautiful piece of art." Nancy and I went to a local artists show looking for a very specific location in our home. We visited with several artists, but gravitated back to Brenda. We liked her work and thought she was a good fit to work with us. The process started with a conversation. We discussed the space and the general design we had in mind. Before Brenda left northeast Ohio, she visited our home. She not only observed the space we had in mind, she walked the property and chatted with Nancy to fully understand the the space, the views and the colors. We commissioned a piece. Brenda sent us several designs. We chatted by phone about modifications and colors and then locked in the design. Brenda told us that when she began her work on our piece she would keep us in the loop. She kept us in the loop not only with email notifications of the process but actual pictures from her studio. It was like we were there watching the piece be created. As the piece neared completion Brenda was chased from her studio by hurricane Irma. She took our artwork with her and put the finishing touches on it at a friends studio out of harms way. With the finished piece in hand she asked if she could continue her trip north and install it. We were obviously happy to get the piece ahead of schedule ( even if it was due to a hurricane evacuation). When Brenda arrived with our artwork, and her wonderful dog Ty, we were nothing short of thrilled with the finished product. The wall mural turned out even better than we envisioned. The art fits the space perfectly. 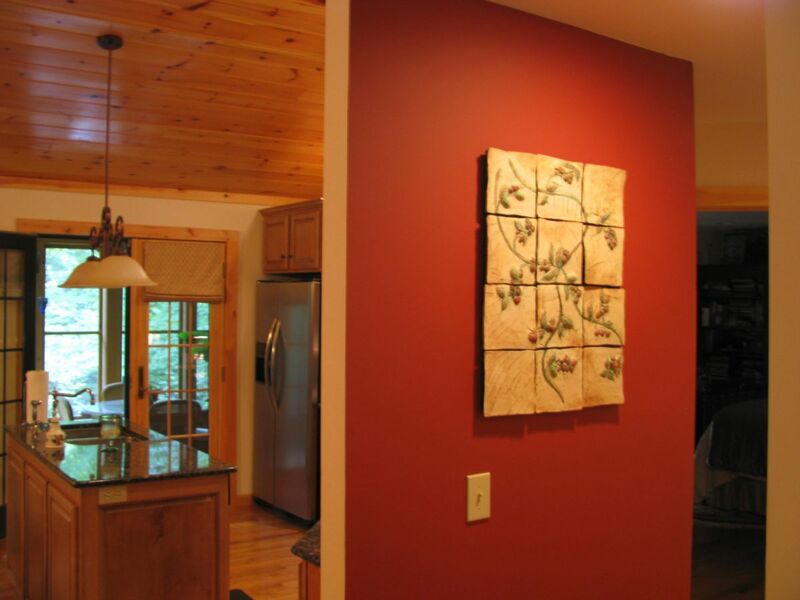 It captures the surrounding colors from our home and landscape. In short, it is a beautiful piece of art. The process from beginning to end was easy. Brenda did what she said she was going to do. She collaborated at the start of the project and kept us fully informed every step along the way. We are happy we selected Brenda for the project. We can unconditionally recommend her. "I love it so much more than a headboard!!" Thank you, Brenda, for creating a beautiful work of art for me. I love it so much more than a headboard!! You are a gifted artist and a real pleasure to collaborate with - and I love seeing you and Ty every couple of years! "Working with Brenda was a truly collaborative process." Working with Brenda was a truly collaborative process. My ideas and suggestions were encouraged throughout the months we discussed design, size, colors, impact, and coordination with my current open-concept home furnishings. At a very sensitive midpoint, Brenda pointed out that micromanaging was not conducive for her creative instincts. It made me finally let go and fully trust that Brenda would create a perfect piece for my home that would make me have that “Aha!” moment. 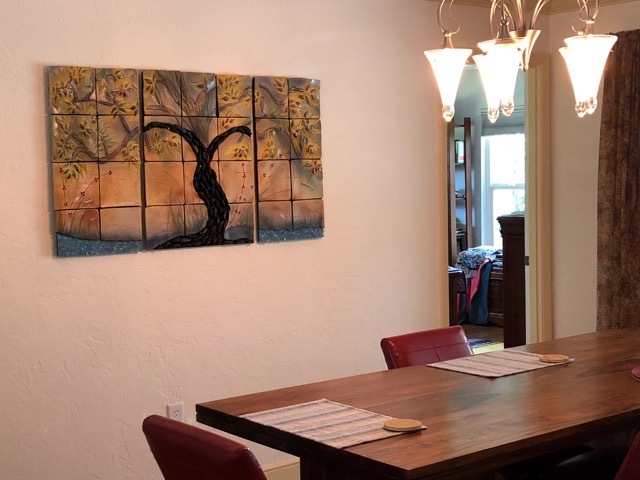 Over the last seven years, while searching for a great piece of art for my dining room wall, I became increasingly concerned that what was available at art shows would, after a time, become boring. I can honestly say that my Trip Tych is a joy to behold every morning. And, it is clear that I will thoroughly enjoy Etz haChayim (Tree of Life) now and well into the future. Thanks, Brenda! "When I saw the completed work, I cried. It was that beautiful." My grandparents gifted me an American Brilliant vase in the '80s and I broke it in the 90's. I was heart-broken. I kept all of the fragments, some large and some small, as I really liked the diamond-shaped cuts and sunflower etchings in the glass. I wanted to use them in another art project. I wasn't quite sure what medium would work best, a handblown glass vase using the broken leaded pieces, a clay art piece using the shards or something else? Nothing seemed to convey the sentiment I wanted to express, so I let the shards sit on my desk for years waiting for inspiration. Fast forward to Art Jones 2017, when I entered Brenda's courtyard exhibit, I knew I had found the right expression for my collection. 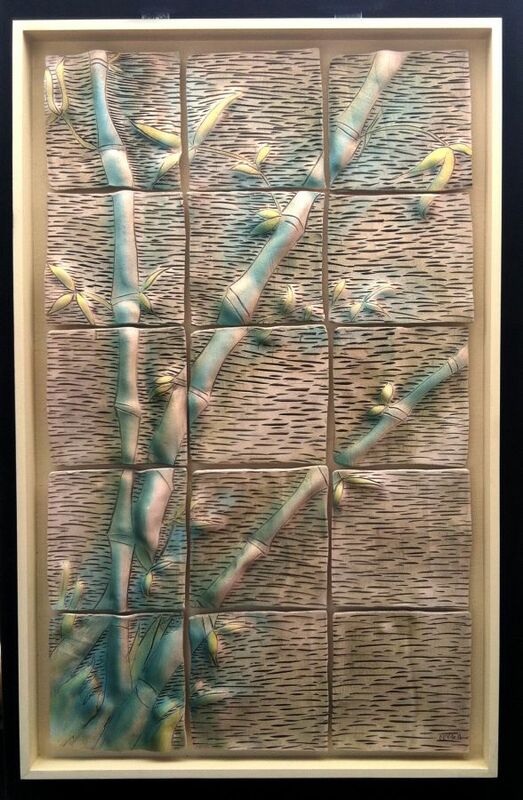 Her tiles with stones and glass echoed the shape of the original vase and the colors of her tiles were appealing to me. I contacted her about my vision. She listened, took notes, moved the glass pieces around and decided she would accept the challenge. We worked on drawings together and began our journey. Brenda checked in with me in each step of her process and was very professional throughout the project. She did what she said she was going to do in a timely manner and she made adjustments when requested. In a couple weeks, Brenda had completed the wall art and it was ready to hang. When I saw the completed work, I cried it was that beautiful. She transformed the fragments into a whole piece that tells its own story. Thank you, Brenda. 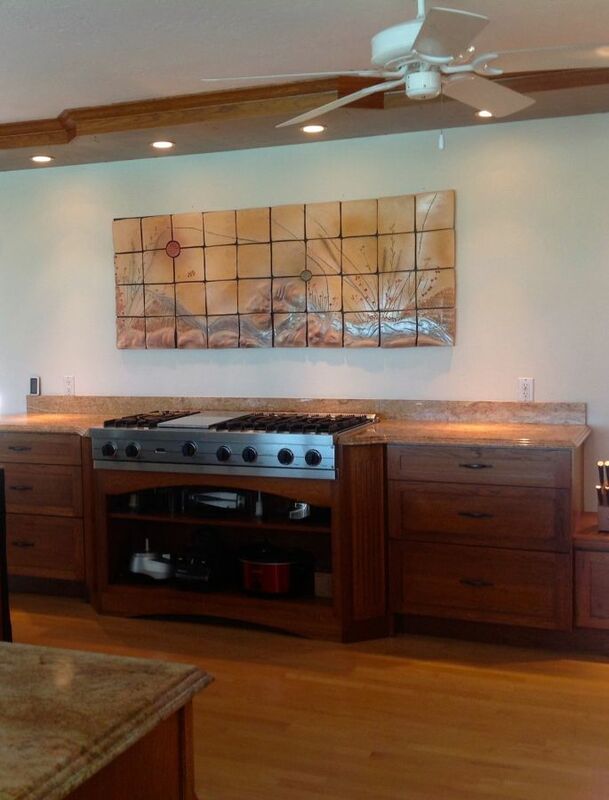 'The artwork is wonderful in the kitchen..., it is unique and I'm happy to have it. Thank you, Brenda'. 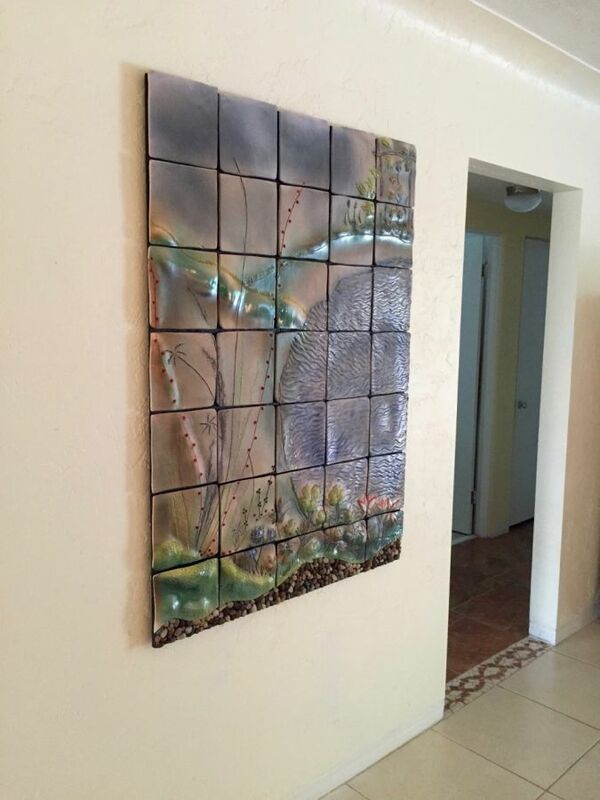 "This magnificent piece of original art"
Brenda took our ideas and through her creative talents turned them into this magnificent piece of original art that is the centerpiece of our Florida lanai! "When she (Brenda) arrived at my house to do the install I was beside myself with excitement - and I was not disappointed one tiny bit!" I met Brenda McMahon almost 20 years ago - I instantly knew she was an incredible ceramic artist and I loved her work. 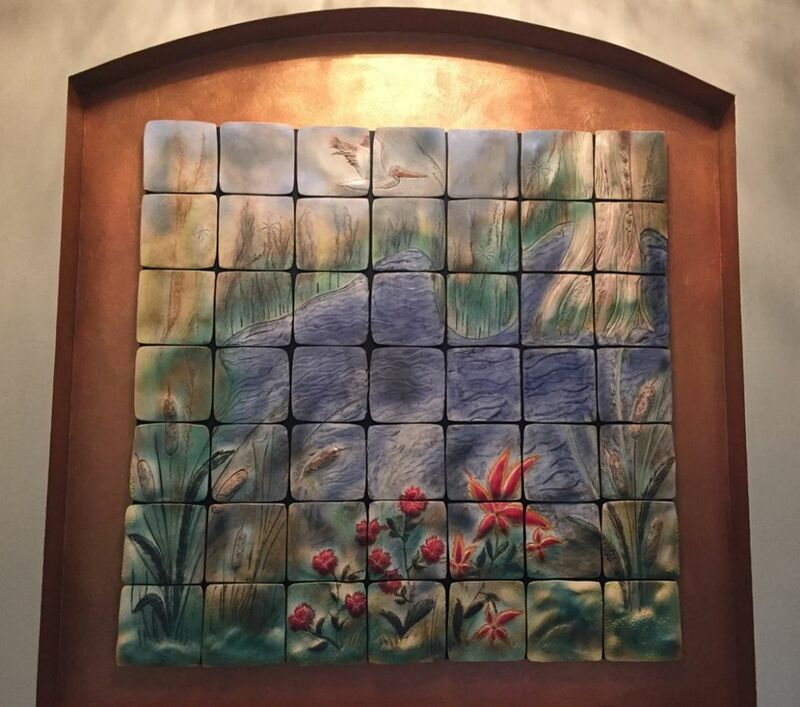 Over the years our paths crossed several times and though I did purchase a couple of her vessels, I knew that eventually I would have to have one of her ceramic tile murals hanging on my wall. A Facebook connection enabled us to stay in touch easily and when I learned she was going to be coming to NY this summer from her home in Florida, I knew it was the right time to work with her on the wall mural of my dreams. Brenda is a consummate professional and included me in every step of the process of creating my piece. 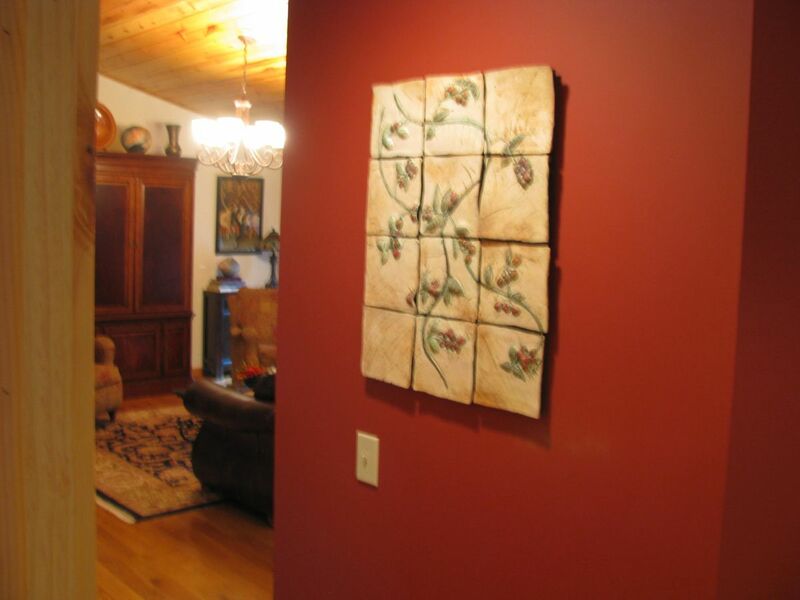 I gave her an idea of my taste and where the mural would hang, and she shared design pictures and then progress pictures throughout the entire creation process. When she arrived at my house to do the install I was beside myself with excitement - and I was not disappointed one tiny bit! 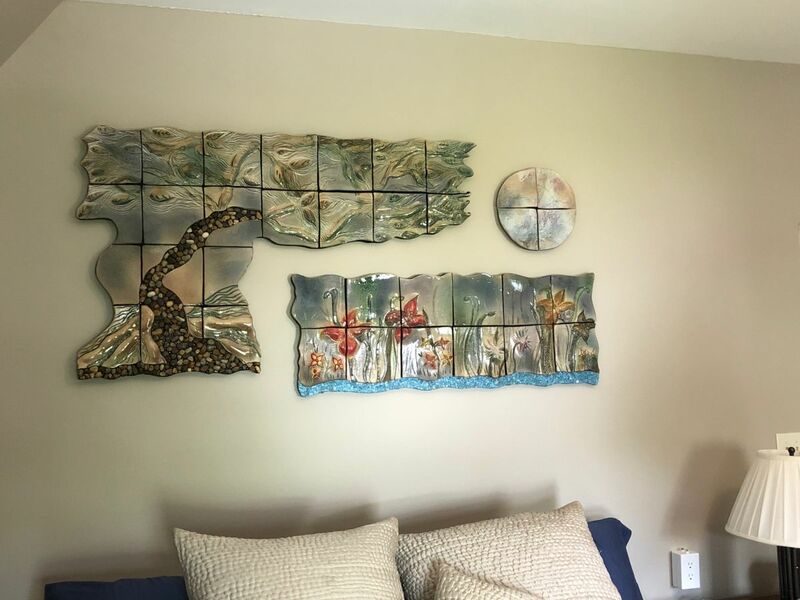 I now have the most beautiful ceramic tile mural hanging on my living room wall - and I'm already thinking about what kind off piece I want for my bedroom! Thank you Brenda for sharing your gift of talent and making the whole process so easy for me! 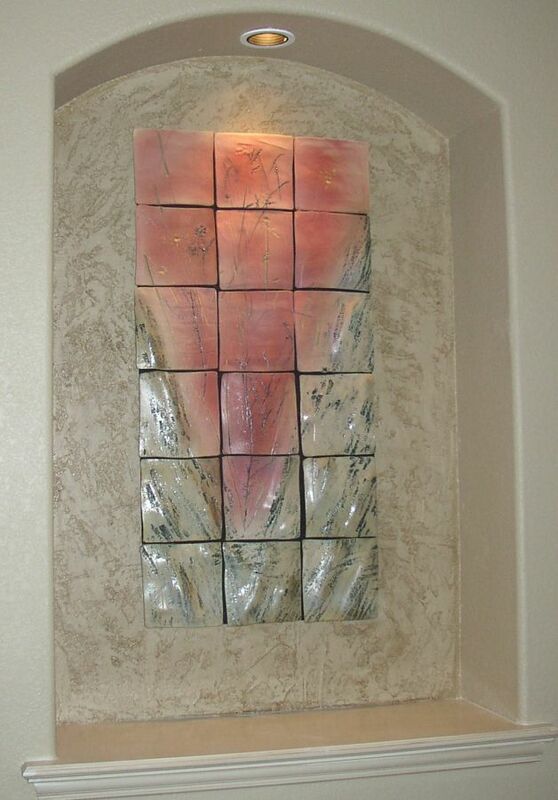 Sculptural tile art for an impressive entry alcove. 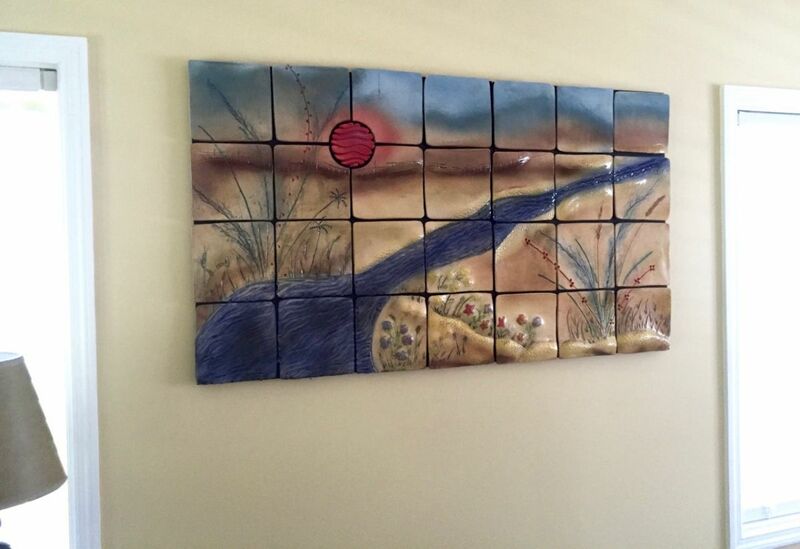 Hand-made ceramic art on an entry accent wall. "Grassy Serenity was more impressive than we had expected. The piece is large... and begins the theme and color flow of our home. We could not be happier with Brenda’s creation. " My wife Lindie met Brenda at the Ft. Myers Art Festival in February 2016. 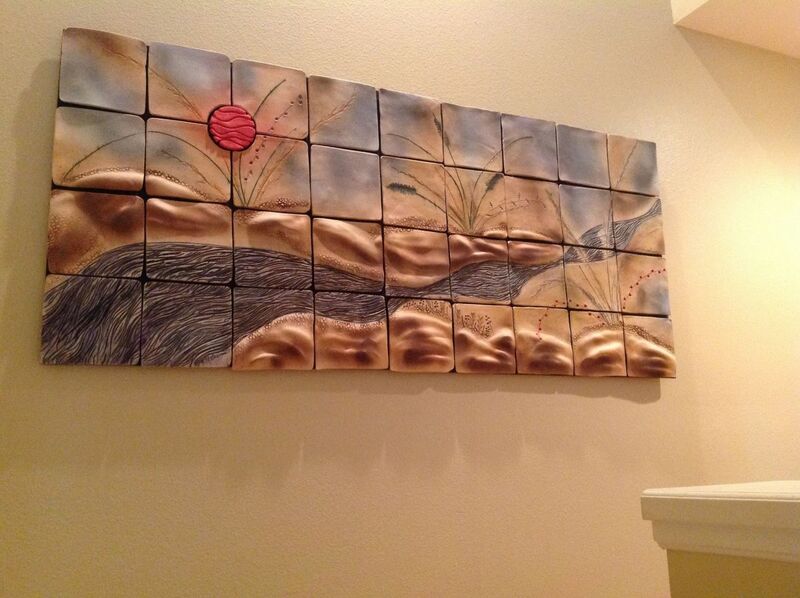 She found her ceramic tile work different, attractive and interesting. After several conversations we decided to engage Brenda in a commission for an important location in our new home. We knew that we wanted something unique as the space is the first thing that visitors see when they enter our home. 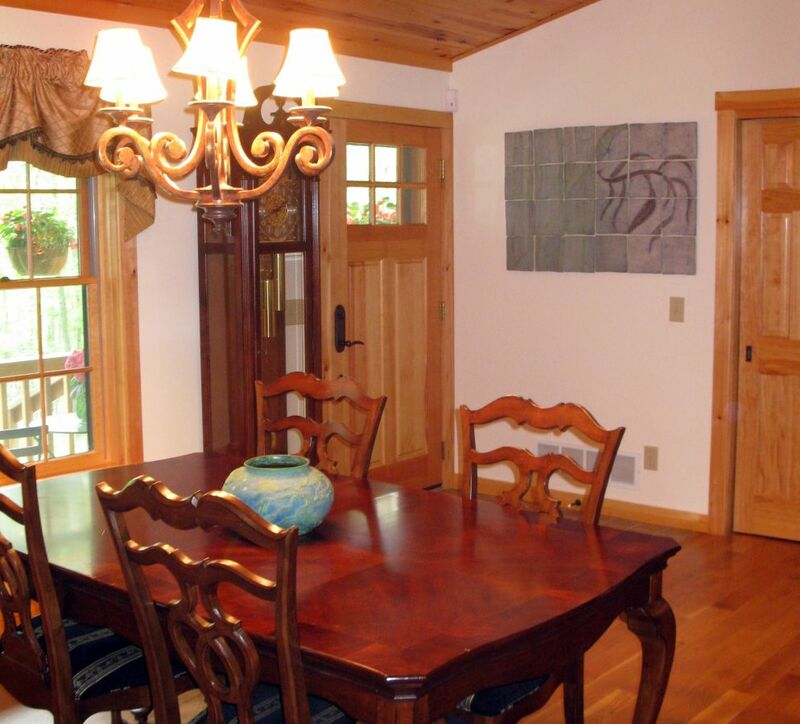 It was also imperative that the theme and colors use connected the entry to the other focal art pieces throughout the house. Beyond that point our ideas became somewhat elusive. Brenda’s process and patience brought out those ideas and gave them form. We had three collaborative conferences and several “is this what you had in mind ? ” email exchanges. The resulting work “Grassy Serenity” was more impressive than we had expected. 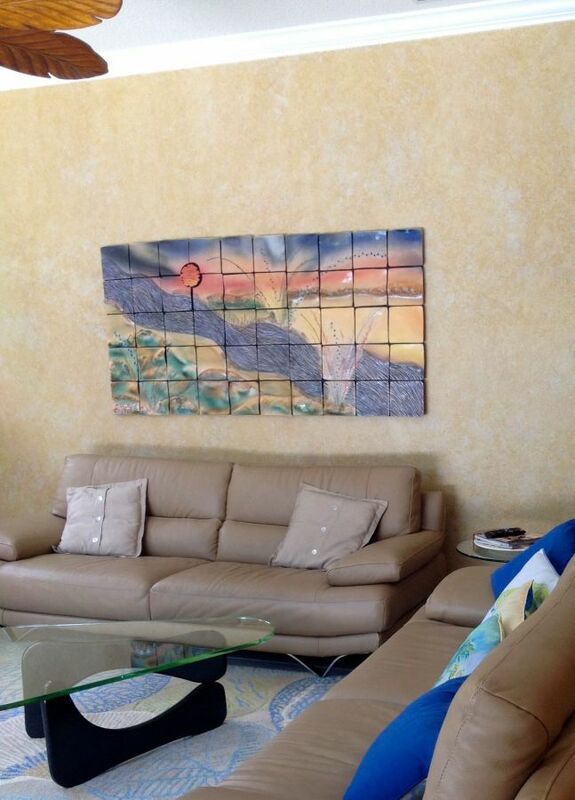 The piece is a large one (50” x 50”) and begins the theme and color flow of our home. We could not be happier with Brenda’s creation. Brenda is not only a very talented artist but a professional business person. She delivered on all of her commitments and completed our piece ahead of schedule. We would recommend her to anyone especially to those looking for a unique piece of art from a talented artist. "It was a thrill to first see it in person! It was even more impressive than we had imagined and, of course, the more you look, the more you see." 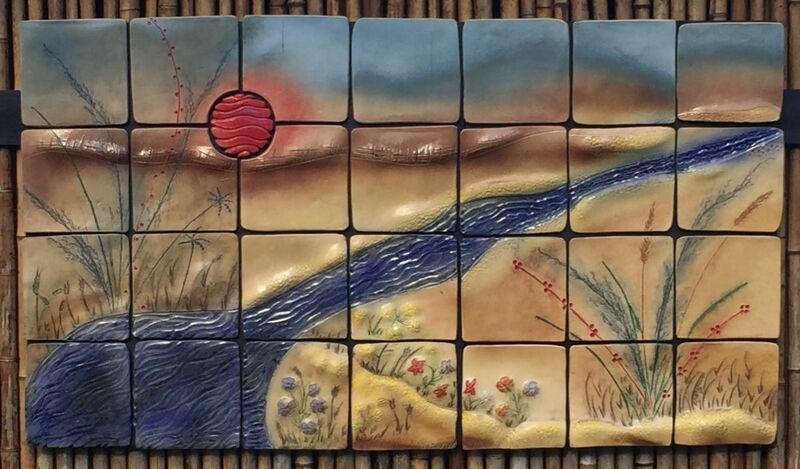 We recently commissioned a tile hanging from nationally known ceramic artist, Brenda McMahon. It has been an amazing journey taken together. Brenda's approach is one that is very collaborative, not just in word, but in reality. Her goal is to create a piece that gives her artistic freedom and satisfaction, while at the same time reflects what you desire. As the buyers, our goal was to articulate the kind of piece we wanted while remaining open to her thoughts, experience and needs. Our conversations were all delightful and we were thrilled with the amount of sharing and exploration that went into her development of our piece. An invaluable bonus is her sharing photos and even a video or two of the caring and detailed process she goes through over a period of weeks to create her final work. It was exciting for us as we understood better the complexity involved and we found the sharing to be illuminating, informative, confusing, clarifying, and very addictive. We loved every bit of it. 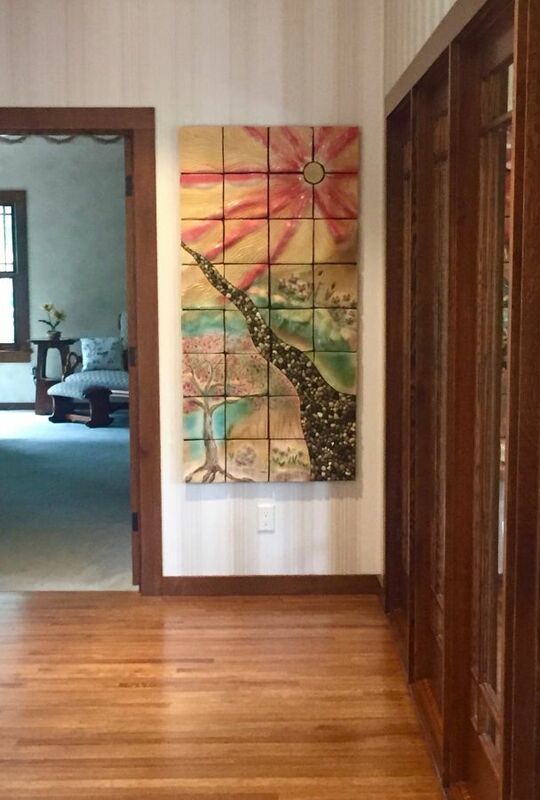 Brenda gave of herself and grasped our thoughts, while using her own creativity to produce a stunning piece that now hangs in our entryway at an angle that can be seen from the living and dining rooms, plus our outdoor patio. 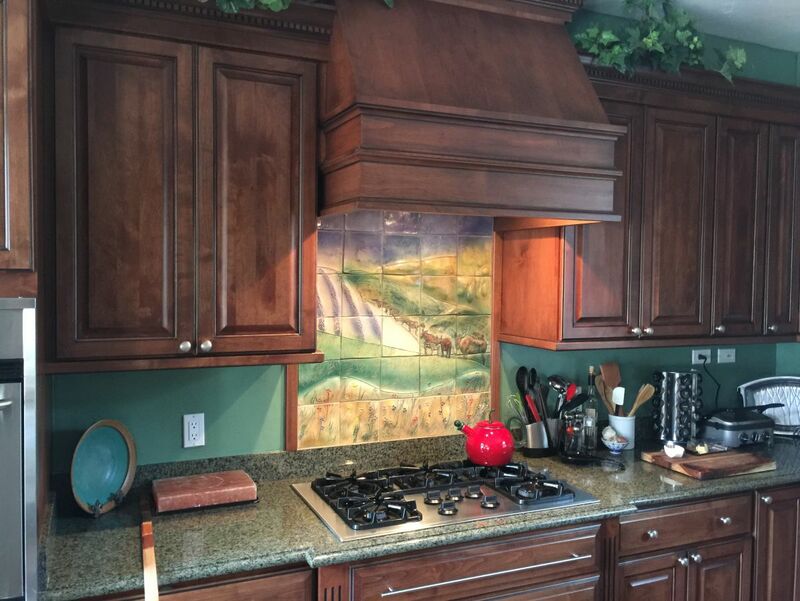 "I couldn't be happier with how it all turned out and want to thank you again for working with me to translate the vision I had into such a lovely, tangible centerpiece for my kitchen!" Needless to say, I couldn't be happier with how it all turned out and want to thank you again for working with me to translate the vision I had into such a lovely, tangible centerpiece for my kitchen! 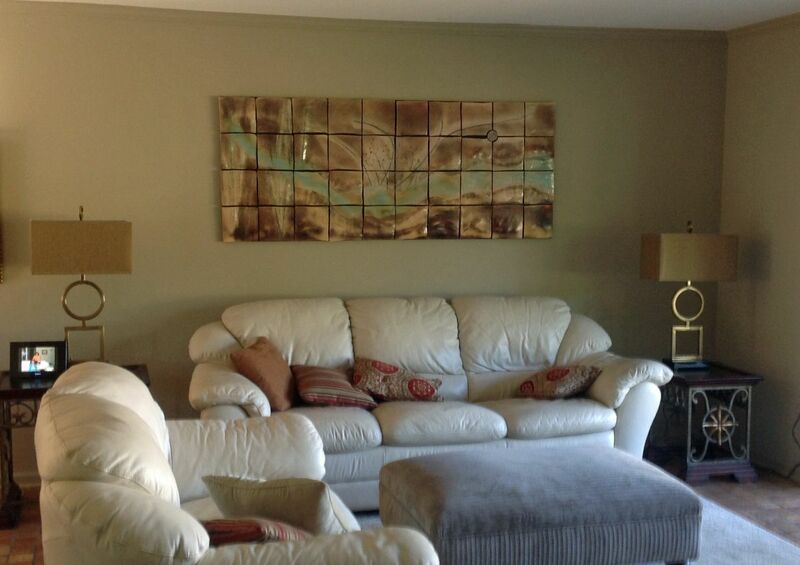 "We love Brenda's work and would highly recommend commissioning her to create a special piece of art." 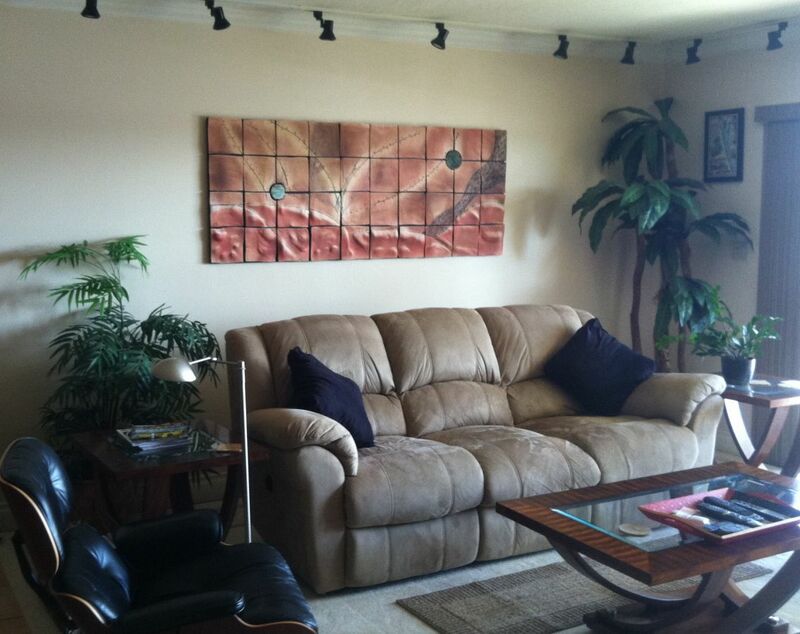 We commissioned Brenda to create a dimensional wall art mural. From start to finished piece she was exceptionally receptive to our ideas. 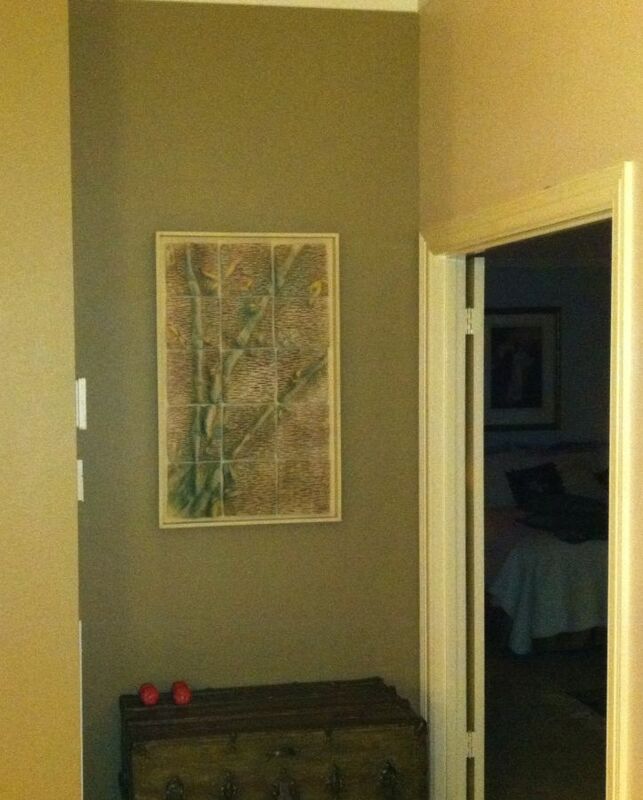 Her drawings grasped what we envisioned and she used the space and colors of our home to enhance the piece. 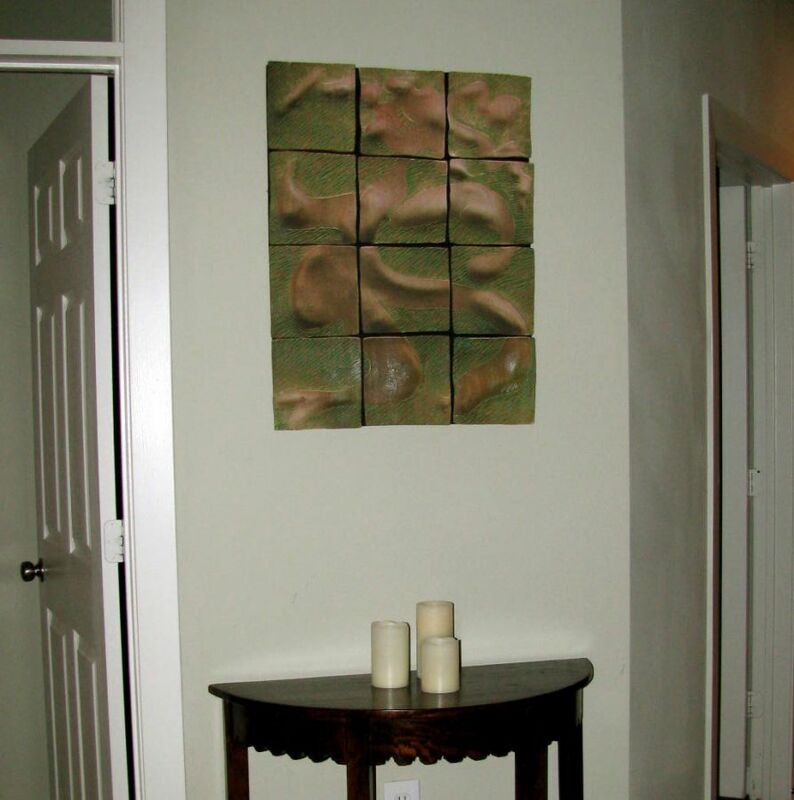 The texture and colors of the piece have made it the focal point of our home. As the light changes so does the mural and we constantly see something new and interesting. Brenda was the consummate professional during the entire process. We love Brenda's work and would highly recommend commissioning her to create a special piece of art.
" If you ever need a reference, you can tell them that Reiko and Phil, on a scale of 0 - 10 would rate your work and the overall experience a definite 20 !!! " 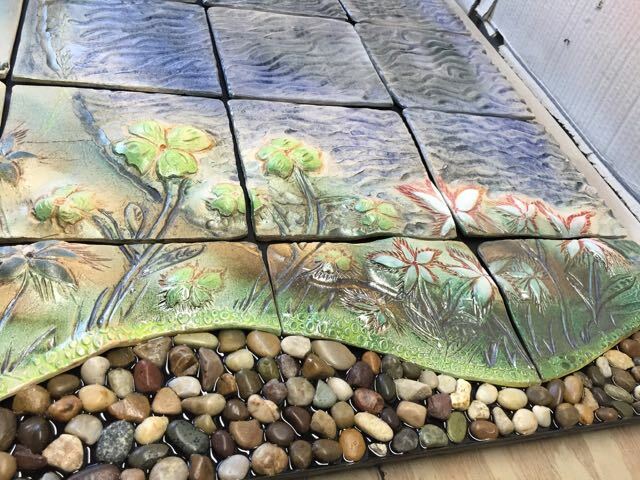 We can both say that the entire process of purchasing a small piece and also commissioning a large tile mural was one of our most positive experiences ever. Collaborating with you exceeded our expectations as you were a true teacher and art mentor. You incorporated all of our ideas, and yet kept true to your artistic style, which we love. Through this process we learned to love not only the art, but the artist. And then we saw the final work and WOW was all we could say, and in saying that, we knew it was inadequate. Living with such magnificent work, that incorporates the heart and soul of the artist, and ourselves, truly makes each day special. As we told you over our celebration dinner, you have become part of our life and family, forever. You are a gifted artist, but you are an inspirational person, and we consider ourselves fortunate to be your friend. 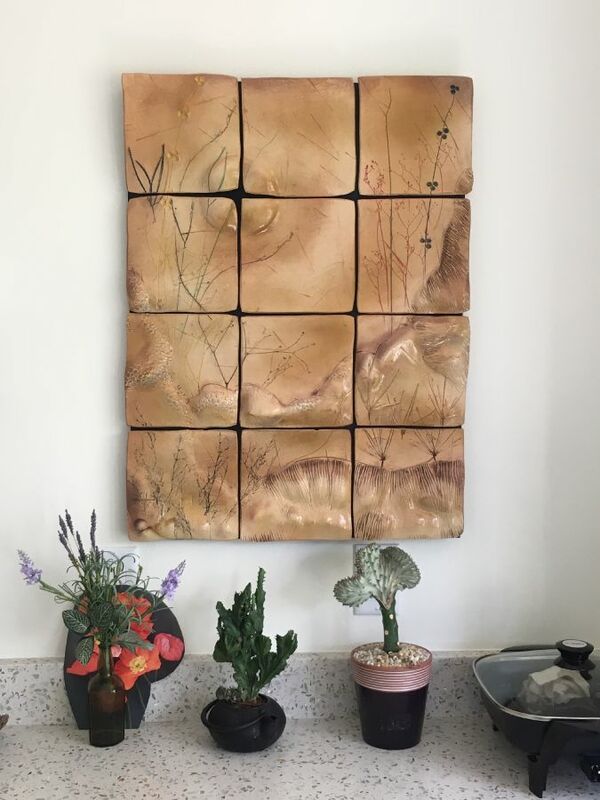 "The detailed process you employ along with your artistic gifts combine to make a truly unique piece"
Bonny and I want to thank you for providing us with one of your unique wall art creations. Since we first met you a few years ago we have admired your work and now have the pleasure of enjoying one of them everyday in our home. 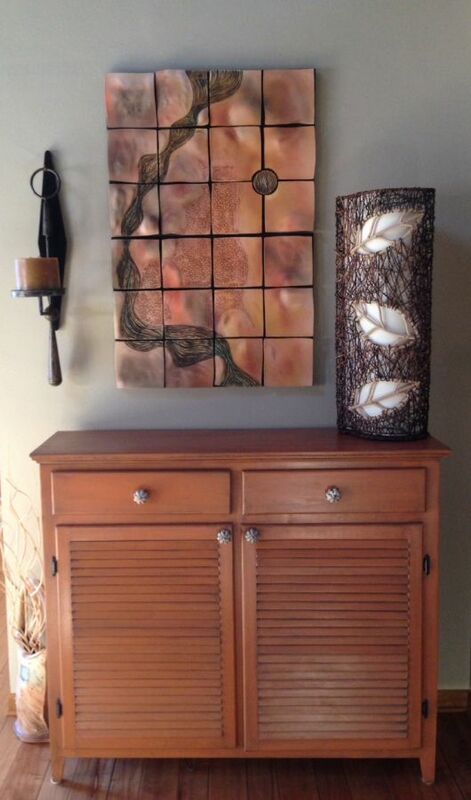 The detailed process you employ along with your artistic gifts combine to make a truly unique piece that fits so well in our home. Many thanks and best wishes going forward. "Your work has such amazing flow and movement, and feels like it's a living part of our room!" I absolutely cannot express how much David and I love our beautiful wall mural! 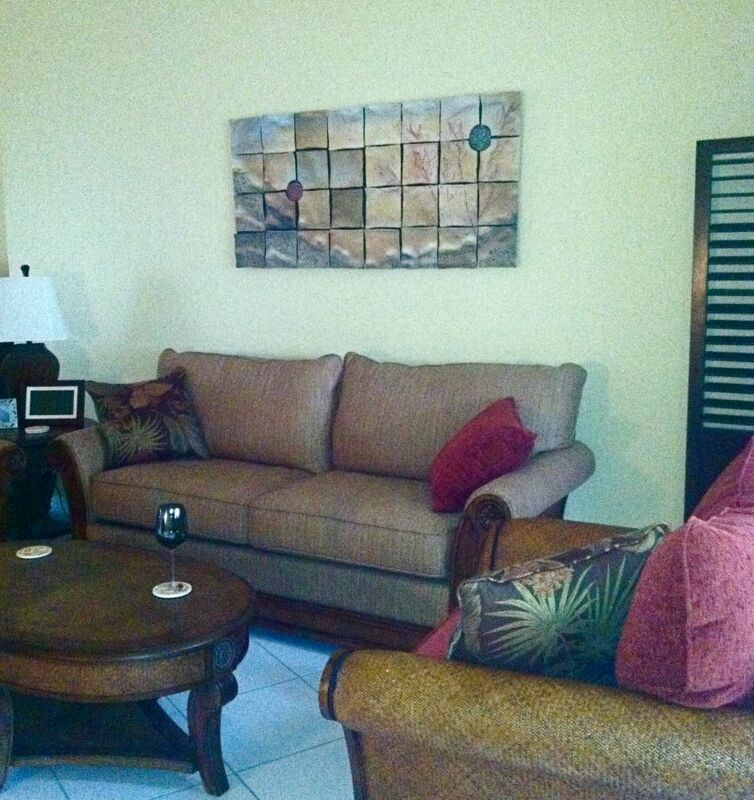 After the complete remodel of our living room, your piece completes the room to perfection. Your work has such amazing flow and movement, and feels like it's a living part of our room! Working with you was an absolute pleasure and David and I are so appreciative of the time and care you took in delivering and hanging our new piece. I hope you come to Pensacola next year as my next purchase will be one of your beautiful vessels! 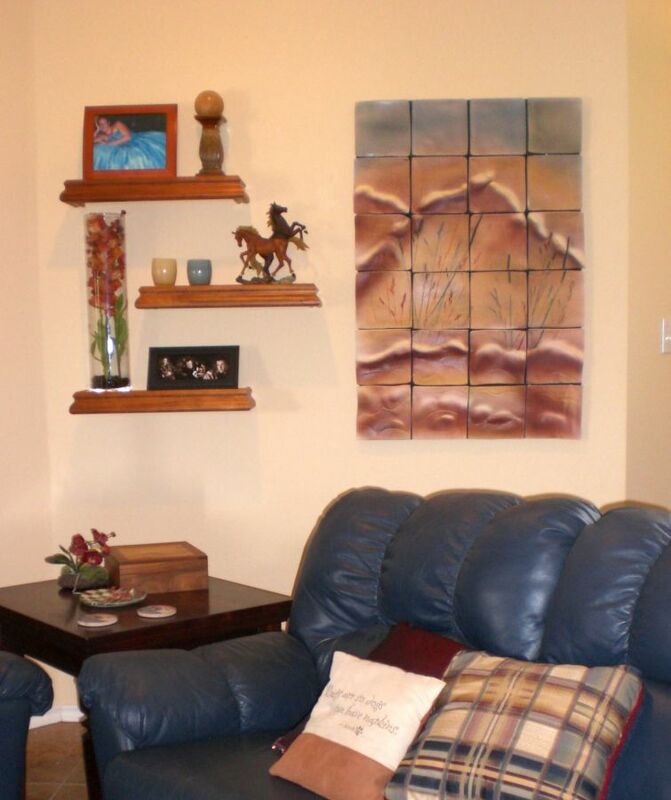 "Brenda's art itself is perfect..."
Brenda's art itself is perfect in our living room, standing out as the primary interest even with many other works in different mediums, collected over many years. Brenda is extremely knowledgable in her craft and communicates it well to both clients and students in her workshops. Her website is outstanding showing her work, technical detail and some underpinning philosophy of it. I eagerly look forward to seeing Brenda again and finding out how her continuing growth has influenced her art. "Brenda McMahon is a great artist as well as business woman." a piece of art and get a blow-by-blow description of its progress." We found the whole experience fun, interesting and exciting! It's not everyday a person gets to commission a piece of art and get a blow-by-blow description of its progress. For the time period involved for the completion of our piece, we were sent emails with links to her site showing pictures of the progress. This only added to the anticipation we felt as the time for the delivery and installation drew near. When the pieces (we were shown 2...!) were hung on the wall, the rules were we had to leave the room...how fun! Well, the first one (and our final choice) took our breath away! It was just perfect! The second one was great but just a little too light in color. I almost wanted to keep both, but, as Mike said, "We want to keep the first one special...". I know the second piece will find a good home very soon. We will be recommending Brenda at every opportunity, not just because of her talent, but because she has a very good grasp on how to work with her clients and good customer service values. We wish her every success and happiness! was more than we could ask for!" I saw your beautiful artwork a year ago at the art festival in Melbourne, FL. I never stopped thinking about it. Knowing my husband Gary would love it, I was thrilled to see you back this year. was more than we could ask for. What a wonderful experience for our entire family ! Thank you again. Hope to see you in Florida soon. "There are times when artists have awed me by the beauty of their work, and Brenda McMahon is one of those artists." There are times when artists have awed me by the beauty of their work, and Brenda McMahon is one of those artists. 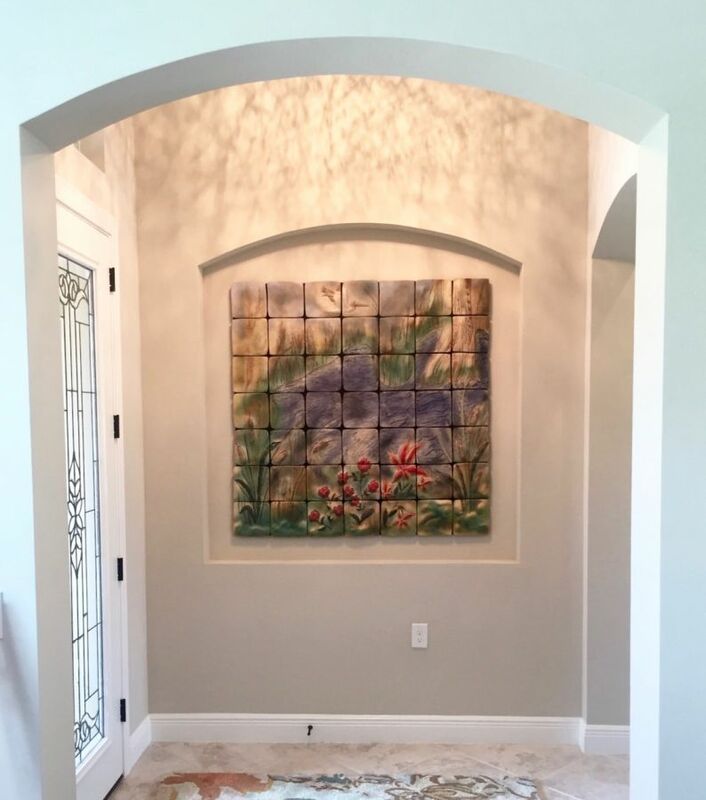 Having purchased a number of her vessels over the course of several years, I then turned to one of her beautiful wall murals. 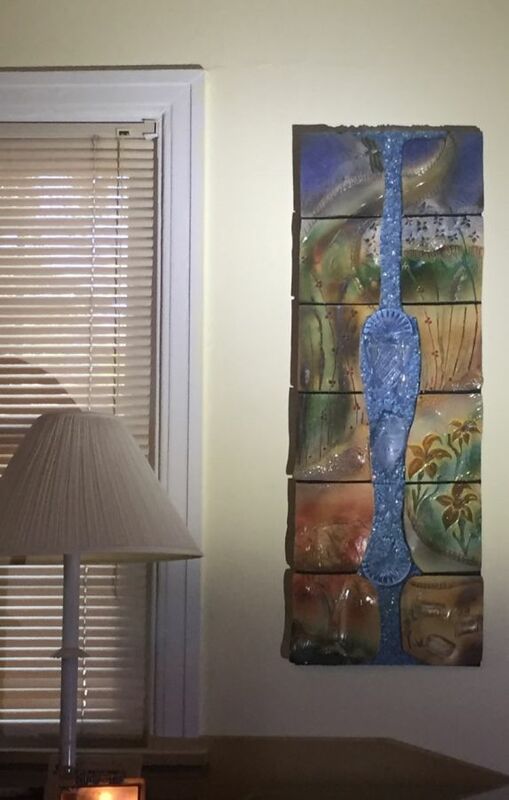 I have always been drawn to Asian-inspired art, and that is the feeling I get with Brenda's pieces. 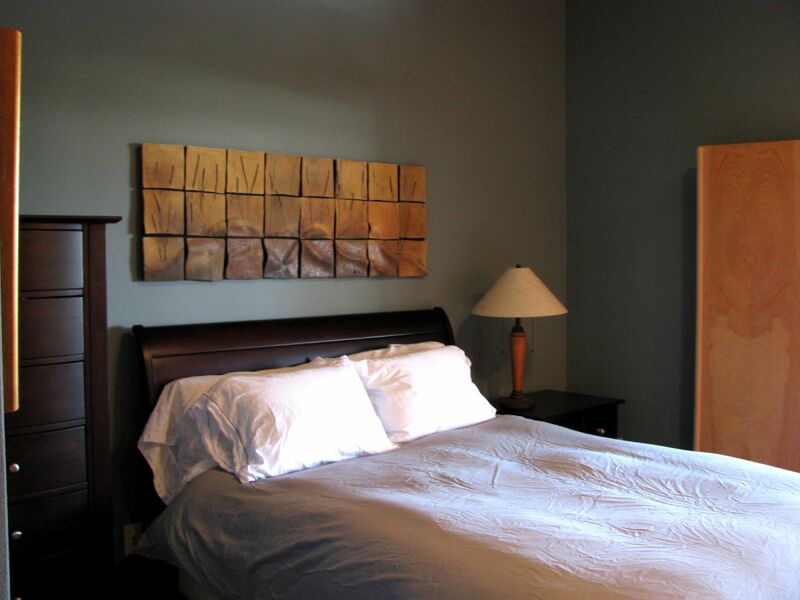 I was allowed to purchase the mural over the course of several months, so my purchasing experience was most pleasant and affordable. I then decided to ask Brenda to create a custom piece for me, and I was rewarded with exactly what I wanted. It was personally delivered and installed by Brenda. If you are searching for an art piece that is beautiful and unique, I recommend that you look at Brenda's work. You will be as thrilled as I am. "We absolutely LOVE your work"
We absolutely LOVE your work and are enjoying it immensely. Thank you so much. Let us know when you are going to be in town again, we will have a glass of wine together! "We love, love, love it!" Rob will take some pictures and get them to you. Thanks for everything. "We couldn't be happier. Thank you for your talent." Mike and I are enjoying your piece in our home. Both receive comments and compliments all the time. We couldn't be happier. Thank you for your talent. We hope to see you again in Milwaukee. 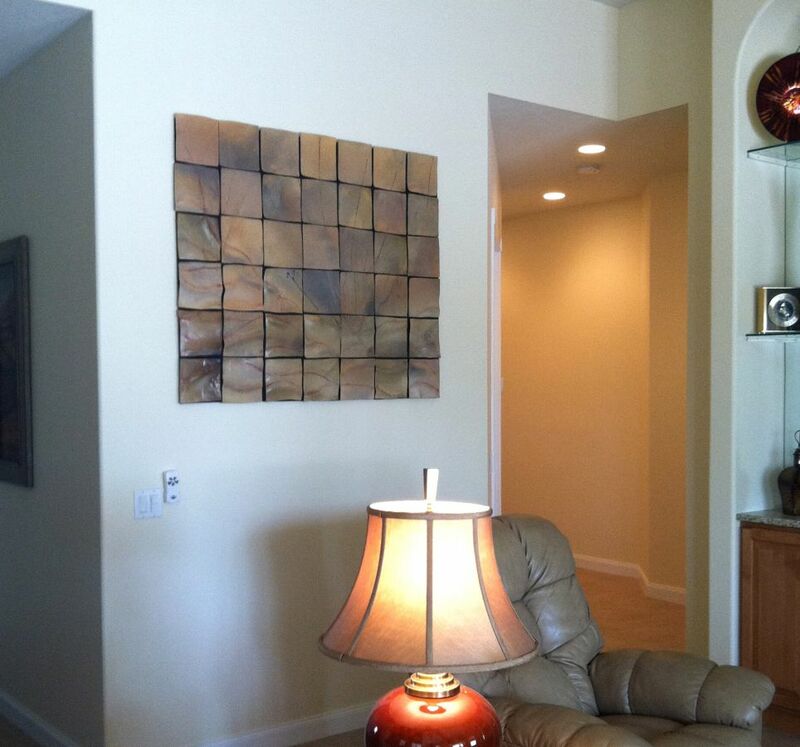 "Your work is now the focal point of our living room and we will cherish it always. Working with you has been a joy. " Pat and I finally had time today to open and install the mural. We are so pleased with it. It is so much more than we had hoped for. As with all beautiful art, photos do not do it justice. Your work is now the focal point of our living room and we will cherish it always. Working with you has been a joy. Your professionalism and high level of customer service is a rarity today and much appreciated. Thank you so much for sharing your talent with us. It really looks great and we wouldn't change a thing! You have been so great to work with. "Brenda listened to everything we discussed. The art she created for us is magnificent."